How Are These Dude Late Night Hosts Still Bleating at Each Other? Five years ago, Jimmy Kimmel wasn’t very nice to Jay Leno. 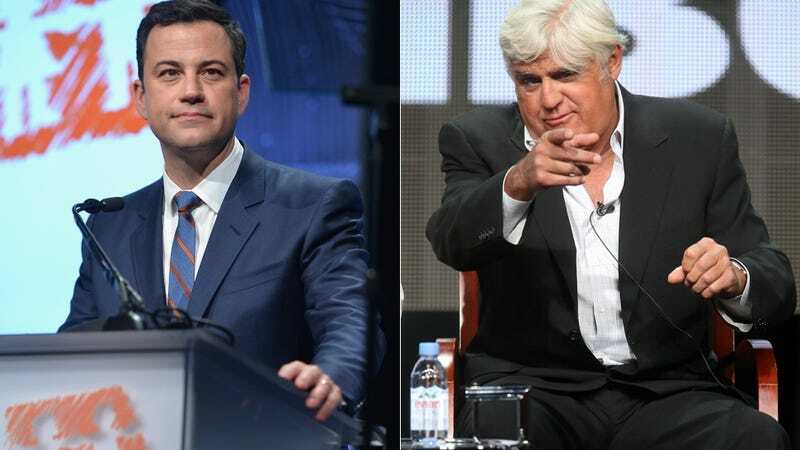 Now, in 2015, Jay Leno is calling Jimmy Kimmel mean. GOOD GOD. Has any battle between whiny, rich, famous white dudes ever been as boring as the late night wars? At the time, Kimmel took offense on Conan’s behalf and performed his show Live! with Jimmy Kimmel as a crude and cartoonish parody of Jay. Afterwards, Leno invited Kimmel onto his show, Kimmel accepted the invitation, and what followed was one of the most cringe-worthy interactions between late night hosts to ever occur on television. While this was a very challenging time for the dorkball comedy nerds (who basically treated Conan’s ousting like it was the Kent State shooting), life moved on. Conan found a new home on TBS and continues to be wealthy and successful, Leno retired for a second time, and Jimmy returned to doing what he does best (holding the non famous in contempt). For years (apart from a few blips), all has been well in the highly homogeneous world of late night. Too bad then that Jay Leno has returned to stir it all up again. I think he’s a talented guy, I think he’s funny. But he has a mean streak, and it comes across. He does this thing where he takes Halloween candy from kids and the kids cry. What am I missing here? It is funny I guess, but it’s mean-based. I think that’s why he’s not higher in the ratings. To be fair, if you look at the situation from the point of view of Leno (a comedian who hasn’t made a good joke since the ‘80s), you can clearly see that ZzzZzzZzz. But approach it from Kimmel’s angle and it becomes blatantly obvious that WHO CARES.